Though Wind World (India) Ltd. has made its mark by initiating innovative and quality projects to produce wind-generated electricity, as a nation we're grappling with core issues that impact the quality of life. These are more evident in rural areas, where poverty is a ground reality; which in turn creates hurdles to project activities. To address the larger issues which affect the community in and around our establishments and wind farms, Wind World (India) Ltd. works in tandem with various agencies to positively impact these communities as a whole. There is not enough blood available which is safe. Recognizing the importance of this dire need for blood in semi-urban areas, we organize a number of Blood Donation Drives across its various locations, periodically. 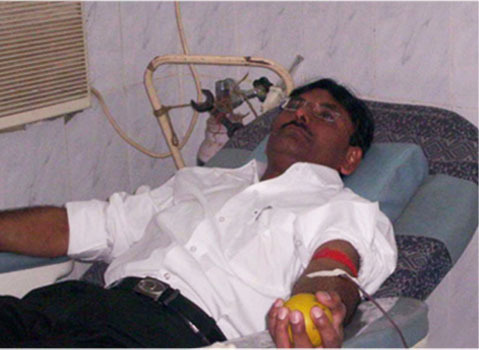 Hundreds of WinDirecters voluntarily donate blood, which is in turn given to various Blood Banks in the country. This is an incredible act of kindness to help the community. Basic infrastructure like classrooms, furniture, toilets and sports facilities have been built in schools wherever we work. Students have been provided books, stationery and sports equipment. Modest as these steps are, they provide opportunities for quality education in rural areas. To help address the issue of rural unemployment, training is provided by experts often at ITIs, thus, opening avenues for rural youth to get started in life. A number of villages still remain deprived of primary healthcare due to lack of facilities. We provide basic healthcare by organizing health camps in villages. Drives for immunization, sanitation, and blood donation are taken up regularly. Awareness programmes on HIV/AIDS, family planning, health and hygiene are conducted for the villagers as preventive healthcare measures. A mobile van with a doctor and trained nurse visits the villages around the Daman plant, providing check-ups and free medication. Wind World (India) Ltd. encourages the local youth, by organizing rural sports and providing sports equipment and facilities. Sponsoring badminton, volleyball, hockey, table tennis, cricket, athletics etc., have helped to inculcate a sportsman spirit in the youth. Through sponsorship and active participation, art and culture is promoted through support of festivities and local events that help spread a message of harmony. We have been providing support by creating basic infrastructure in villages. Stone pavements, drains and gravel roads have been constructed. To cater to the drinking water requirements, tube wells, hand pumps and water tanks have been provided. At dispensaries we have been providing furniture, fixtures and essential equipment. This improvement in rural infrastructure is an on-going affair.